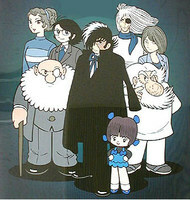 Controversial Chapters: Five chapters of Black Jack elicited controversy when they were released and have since either been never re-printed, or rarely re-printed. These are #28 "Finger", #41 "Vegetable," #58 "Seat of Pleasure, #171, "The Wall" and #209, "Falling Object." The first three have never been officially reprinted since their original serialization in Weekly Shonen Champion. Chapters #171 and #209 were respectively reprinted in a special issue and an anthology of Black Jack stories by other manga-ka. Licensed by: Taiwan Tohan Co., Ltd.